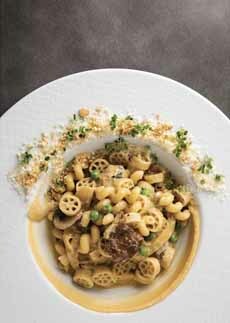 This mac and cheese recipe uses both wagon wheels and cavatappi instead of elbows (photo courtesy Barilla Foodservice). At Burtons Grill in Andover, Massachusetts, chef Scott Perry has fun with mac and cheese. It turns everyday mac and cheese into food art. It’s easy to replicate at home. A mix of two pasta shapes. Chef Perry uses two different kinds of pasta. Forget the same old, same old elbows and try wagon wheels (ruote) and cavatappi, a fancy corkscrew. Or pick whatever shapes appeal to you. Check out the different shapes of pasta in our Pasta Glossary. A topping of peas for color. You can substitute julienned sundried tomatoes in oil, diced red bell peppers (raw or blanched), or strips of pimento. A rim of bread crumbs. Instead of sprinkling bread crumbs on top, Chef Perry puts them on the rim of the bowl, along with microgreens (substitute minced chives or parsley). We liked this idea so much, we actually purchased soup bowls with broad rims—which trendy chefs are using to serve just about anything.